Koi fish are decorative ornamental fish that are kept in fresh water ponds in homes and businesses. 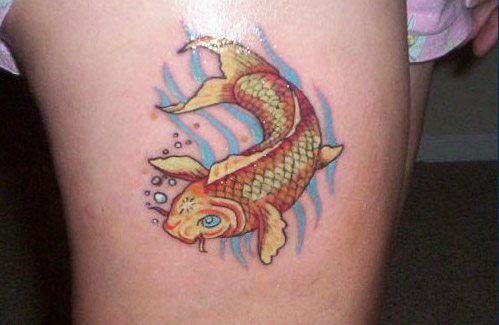 The koi isn’t just a pretty fish; it has a deeper meaning in tattoo art. 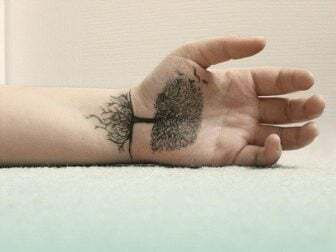 Because they achieve greatness in Chinese legend, they are a symbol of success and achievement, and because they are expensive, they are a symbol of wealth (a product of success). Koi tattoo designs are often chosen for their beauty. The koi fish twists across the design in an elegant curve of orange, yellow or red and white, surrounded by Japanese waves tattooed with blue ink. 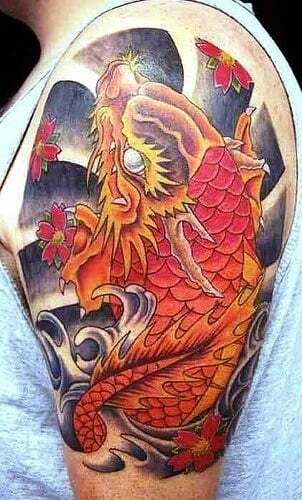 The warm colors of the koi fish in the tattoo are contrasted by the cool colors of the water patterns. Color contrasts are attractive to the human eye, creating visual harmony between two opposing forces. Ancient Chinese legends describe koi swimming up the Yellow River to a place called the Dragon’s Gate. The Dragon’s Gate was at the top of a tall waterfall and very difficult to reach. Although all the koi tried, only a few were able to leap up the roaring waterfall and pass through the Dragon’s Gate. Once through the gate, the koi would transform into a beautiful, powerful dragon. This transformative process has a similar symbolism to the process of metamorphosis in butterflies. The koi carp is similar to the caterpillar, who fights to change into a beautiful winged creature. 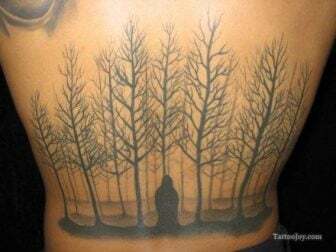 The process symbolizes change, achievement, new beginnings and success. Koi tattoos are sometimes worn as a symbol of power, achievement and success. Because koi fish are very expensive, only the wealthy can afford to keep them. The golden yellow coloring of many koi is associated with the precious metal; gold, and so koi are a symbol of wealth and success. A shimmering, golden koi in the water seems like a living statue sculpted out of the purest gold. The shining, elegant allure of the koi fish means that it is also a symbol of luxury in tattoo design. Housing koi fish requires thousands of liters of water and a lot of space. Because they are fresh water and cold water fish, koi can be kept indoors or outdoors. Kois are hardy enough to survive in ponds that have a layer of ice covering the surface of the water. 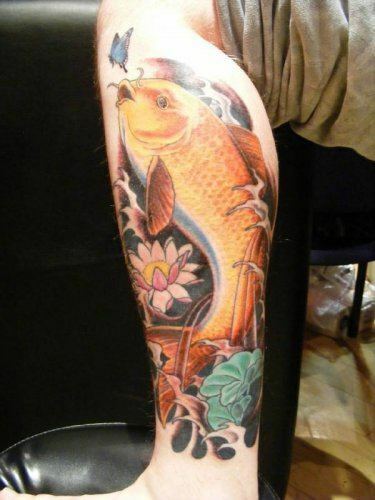 Because of this, koi fish are regarded as strong and brave and have become a symbol of strength and courage. A koi tattoo can be accompanied by several symbols and design elements. 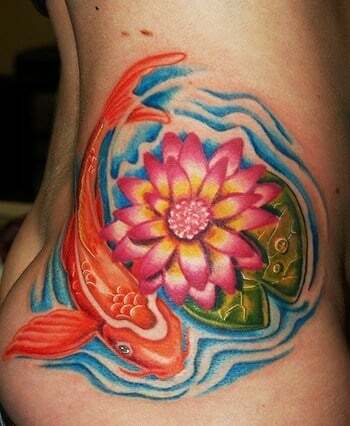 Lotus flowers and lily pads are often used in a koi fish tattoo design to add more symbolism and color to the design. Lotus flowers fight their way up through the muddy bottom of the pond, pushing their flower bud into the air above the water before finally producing an exquisite flower. This process give lotus flowers the meaning of achieving beauty through adversity, another symbol of success. 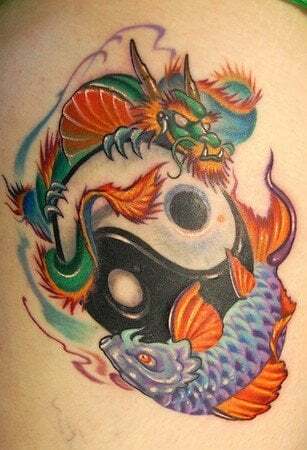 Because of their association with dragons in Chinese legend, koi fish are often accompanied by a dragon in tattoo designs. In the Chinese legend described above, koi fish transform into dragons after leaping up a towering waterfall. Dragons are a symbol of strength, material wealth and success, the same symbols that koi fish stand for. In Japan, the word “koi” sounds a lot like another word that means “love” or “affection”, so koi fish have become a symbol of friendship, relationships and love. 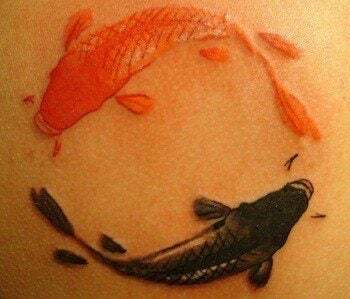 The bright colors and attractive scale patterns of koi fish tattoos add to the friendly, emotive nature of koi fish designs. Matching tattoos of koi fish are a meaningful token of love between friends or relationship partners.